I read this article and found it very interesting, thought it might be something for you. 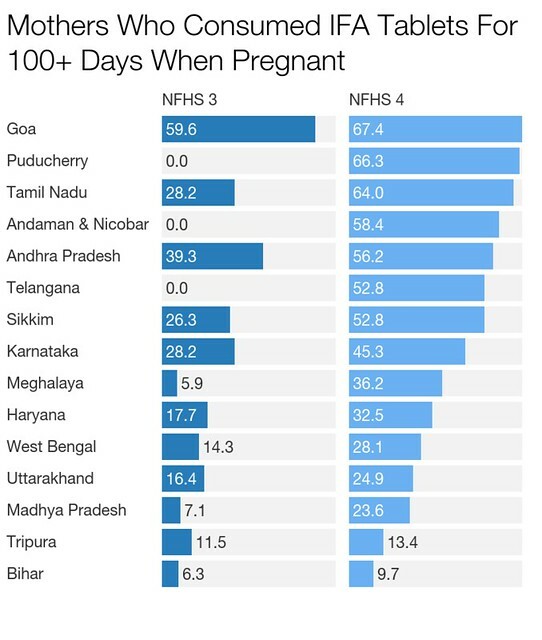 The article is called Many Indian Children, Mothers Healthier Than Ever: Latest Data and is located at https://archive.indiaspend.com/cover-story/many-indian-children-mothers-healthier-than-ever-latest-data-87036. The Andaman and Nicobar Islands, a union territory, reported India’s lowest infant-mortality rate (deaths per 1,000 live births) and under-five mortality rate (deaths per 1,000 children) among 13 states and two union territories for which data was released this week. 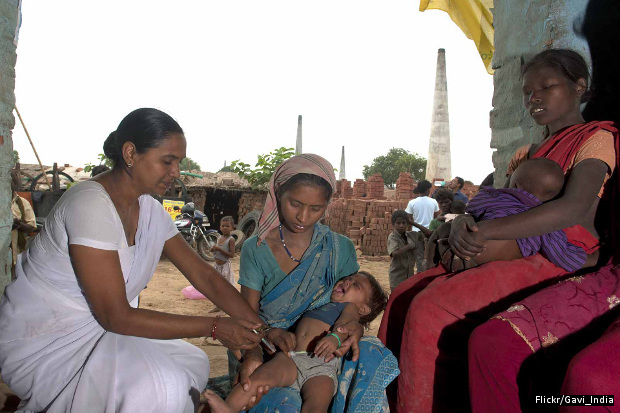 Madhya Pradesh (MP) reported the highest infant-mortality rate (IMR) as well as under-five mortality rate (u5MR) with 51 and 65, respectively, according to data published by the health ministry, as per the National Family Health Survey 4 (NFHS 4), a nationwide health census, the last data for which was released in 2005-06. But some afflictions have seen limited progress, such as anaemia, reported in half the children in 10 states and more than half the women in 11 states. Overall, progress is uneven across India, the data show. The Andaman and Nicobar Islands have an infant-mortality rate of 10, better than Brazil (15), the same as China and Bulgaria, according to World Health Organisation data, and better than a host of countries with higher per capita incomes. In contrast, MP’s infant mortality rate is worse than some of the world’s poorest countries, such as the Gambia and Ethiopia. 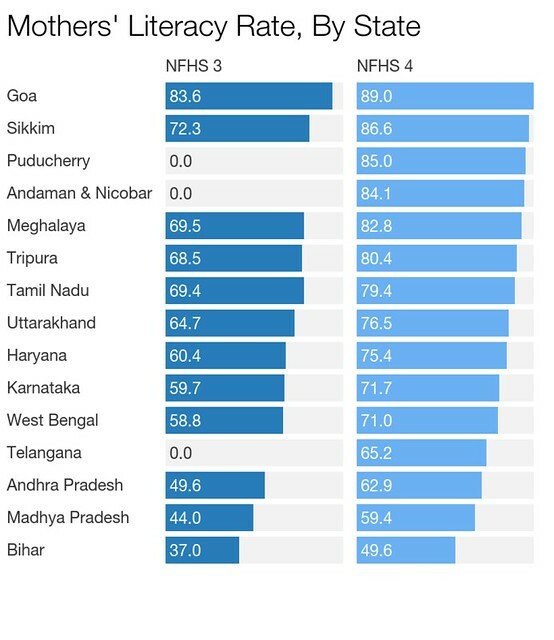 Data for union territories and the newly minted one-and-a-half-year-old state of Telangana have been featured for the first time in the NFHS. Crucial data is missing for some of India’s most-backward states requiring special healthcare intervention by the central government–officially called empowered action group (EAG) states–including Bihar, Jharkhand, Madhya Pradesh, Chhattisgarh, Odisha, Rajasthan, Uttar Pradesh and Uttarakhand. Almost all the 13 states and two union territories have seen a decline in infant-mortality rates and under-five mortality rates. The highest fall in IMR was seen in Tripura–from 51 deaths per 1,000 live births in 2005-06 to 27 in NFHS 4 (2015-16). The highest fall in under-five mortality was seen in West Bengal–from 59 to 32 over the same period. The direct reasons for improvement are better maternal- and child-health practices, such as more breastfeeding, births in healthcare institutions (instead of at home), improved vaccination, and the use of diarrhoea medication. The indirect reasons include rising female literacy, later marriages, better cooking facilities, such as gas–thus reducing health risks from wood- or coal-fired stove–and financial inclusion. The states that have seen improvements in IMR and U5MR clearly improved their child-health indicators. Tripura, which saw the highest decline in IMR, has also seen a decline in the prevalence of diarrhoea, from 8.4% in 2005-06 to 4.9% in 2015-16, and an increase in fully immunised children from 49.7% to 57.7%. West Bengal, which has seen the second-highest reduction in IMR and the highest decline in U5MR, has been able to achieve these through increased availability of oral rehydration solution (ORS) for children suffering from diarrhoea (42.6% to 64.7%) and improving immunisation from 64.3% to 84.4% of children. Karnataka saw a decline in IMR from 43 in 2005-06 to 28 in 2015-16 and decline in U5MR from 54 to 32. The state saw an increase in consumption of iron tablets by mothers from 28.2% to 45.3%. The state also saw an increase in the percentage of mothers who received full ante-natal care from 24.8% to 32.9% and an increase in institutional births from 64.7% to 94.3%–showing a direct correlation between improvement in maternal health and reduction in child mortality. The correlation between sanitation and IMR numbers is well documented. Tripura and West Bengal have seen improvements of sanitation facilities, which have resulted in decreased IMR figures across these states. Female empowerment through literacy and financial inclusion has also helped in reducing infant and maternal mortality. The education of mothers and their ability to make decisions affects infant and child mortality, according to this study published by the UK-based Institute of Development Studies (IDS). This is evident in West Bengal, where female literacy rates rose from 58.8% to 71%, alongside declines in both IMR and U5MR. Similarly, Tripura’s female literacy rose from 68.5% to 80.4% and Karnataka’s from 59.7% to 71.7%. Women in the three states also reported increased participation in household decisions. For example, in Karnataka, female participation increased from 68.6% to 80.4%. One of the reasons for the improvement of status women can also be attributed to their ability to spend their own income. This has been achieved through financial inclusion, which has led to many having their own bank account, the IDS study said.